Bonaparte's Gull is a small gull, with bright white patches in its wings, and a very graceful, almost tern-like flight. It is only found in Tennessee during the non-breeding season, so is much more likely to be seen with a white head and dark ear-spot, than its characteristic black head. It is the only gull to nest in trees, and during the breeding season, it is found in the boreal forest from western Alaska across Canada. In winter it is a common migrant and winter visitor over much of the continent from the Atlantic to the Pacific and south through Mexico. Description: In both breeding and non-breeding plumages, this tern-like gull has a silvery-gray back and wings, a white tail, and white wingtips with a black trailing edge. Below, the bird is white with dark primary feathers. In non-breeding plumage (August-April), the head is entirely white, with a dark spot behind the eye. The head is entirely black during the breeding season (April-August). First-winter birds (September-March) have more dark in the wingtips, a narrow diagonal line on the top of the wing, and a black terminal band on the tail. All Terns have even longer, thinner wings, and forked tails. The Caspian Tern, an uncommon spring and fall migrant in Tennessee, is slightly larger than a Bonaparte's Gull, but always has a red bill, and black cap. Laughing and Franklin's Gulls are irregular migrants in Tennessee, and both have dark wingtips, darker gray backs, and a larger smudge of dark gray behind the eye, rather than a spot. Habitat: In Tennessee, found on large rivers and lakes. Diet: Small fish and large invertebrates. Never found at garbage dumps. 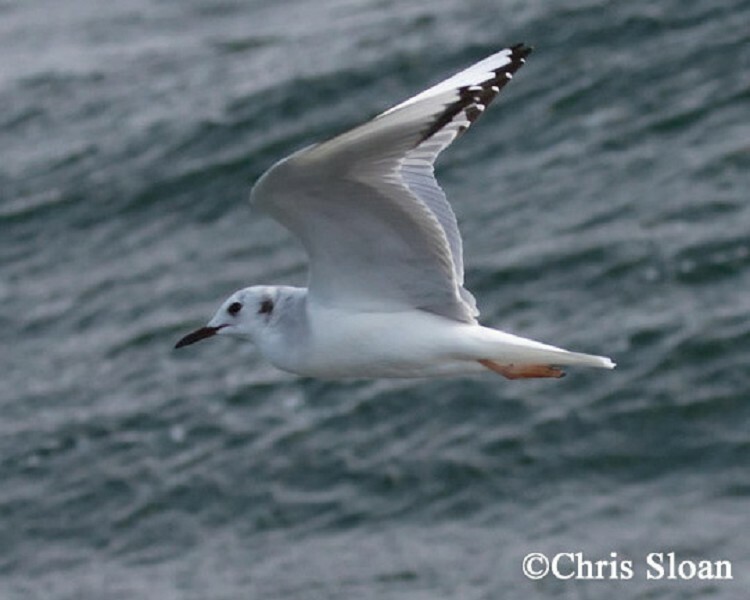 Status in Tennessee: Bonaparte's Gull is a fairly common migrant and an uncommon winter resident, arriving by late October and departing by early May. The Bonaparte's Gull is the only gull that regularly nests in trees in the boreal forest, where it feeds mainly on insects, often catching them on the wing. This gull is named, for a nephew of Napoleon Bonaparte, Charles Lucien Bonaparte, who made important contributions to American ornithology during the 1820s, while an active member of the Academy of Natural Sciences of Philadelphia. Best places to see in Tennessee: In winter, Bonaparte's Gull is locally common on the Tennessee and Cumberland Rivers, Old Hickory Lake, and Chickamauga Lake, but might be found on any large body of water. Can be common on J. Percy Priest Lake, esp. Fate Sanders Marina and other nearby hot spots and on Kentucky Lake from Paris Landing State Park or the Big Sandy Unit of Tennessee NWR. Burger, J., and M. Gochfeld. 2002. Bonaparte's Gull (Larus philadelphia). The Birds of North America, No. 634 (A. Poole and F. Gill, eds.). The Birds of North America, Inc., Philadelphia, PA.